Opened on September 20, 1906, The Grand York is now Yorkshire’s finest 5-star hotel, offering the very best in traditional English style and service. Combining history and heritage, The Grand York has everything a modern traveler could wish for and need, all with a friendly Yorkshire welcome. The impressive and intricate detailing of the building has withstood the test of time and remains a landmark of incredible stature in a city of breathtaking architecture. To escape the city and relax in style, book a suite with windows offering picturesque views of York. This iconic historic building offers 107 luxurious guestrooms and suites, built in true Edwardian style. For guest comfort and convenience, all rooms feature air-conditioning, complimentary WiFi, and a unique spa with a wide selection of services like holistic massages and indulgent facials. 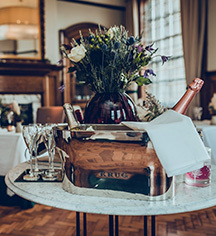 For an exquisite dining experience, choose from sweet or savory snacks, themed tea parties, and even champagne in the English tradition of Afternoon Tea. Experience locally sourced, seasonal ingredients in delectable dishes. The Grand is the perfect venue for a dazzling event, with seven historic meeting spaces that can accommodate up to 120 guests. Located in York, The Grand is less than two hours from London by train, 90 minutes from Manchester, and 2.5 hours from Edinburgh. All aspects of life in York today is linked to its storied past, revealing it to be a rich city full of life. While in town, guests can enjoy shopping at nearby Coney Street Shopping Center, entertainment such as the week-long Jorvik Viking Festival, or float along the gorgeous River Ouse in a York boat. 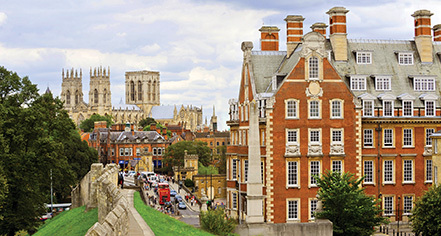 Tours can be booked to visit the National Railway Museum or The Cathedral and Metropolitical Church of Saint Peter in York, also known as York Minster, for a taste of history. The Grand York, a member of Historic Hotels Worldwide since 2018, dates back to 1906. Each of The Grand's guestroom was once an office of the North-Eastern Railway Company and guests may notice the original office numbers that remain above the doors. Cancellation Policy: Cancellation policies vary according to room type. When booking, please check what conditions apply to your preferred room. Cribs and Pack-in-Plays: Cribs available upon request. Please confirm with the hotel. Early Check-In/Late Check-Out: Depending upon availability; late check-out will be £30.00 per additional hour. Parking: Off-site parking is available at the adjacent NCP for £26.00 for 24 hours or at the NCP on Queen Street for £17.40 for 24 hours. There is also a valet parking service available for £25.00 from arrival to noon the next day. Payment: A valid credit card is required to guarantee your booking. Transportation: Private transportation can be arranged through the concierge; surcharge applies. Opened on September 20, 1906, The Grand York is now Yorkshire’s finest 5-star hotel, offering the very best in traditional English style and service. Combining history and heritage, The Grand York has everything a modern traveler could wish for and need, all with a friendly Yorkshire welcome. Learn more about the History of The Grand York .